Please do a short happy dance with me. I finished a project! It is the first finish this quarter. So let’s go for a ride through the country side while I tell you more about „Nonconformist“. 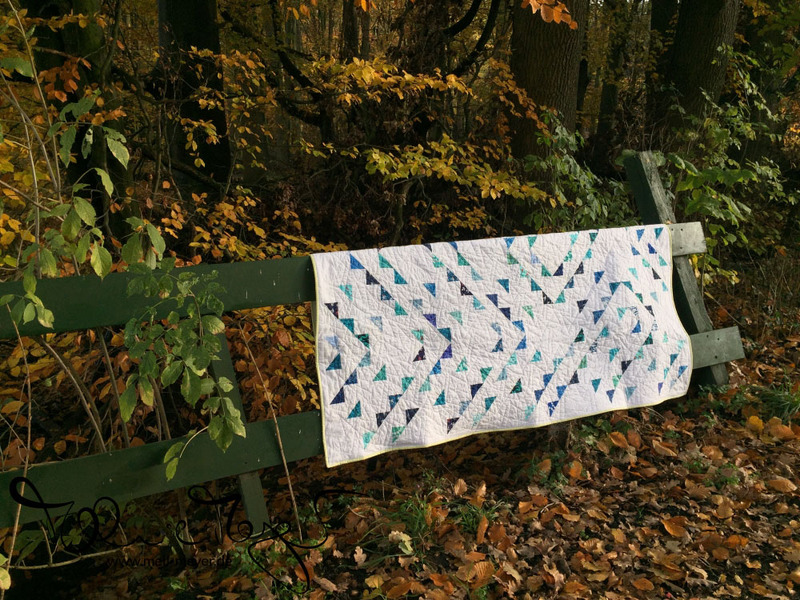 You wonder why you look at photographs of this quilt in the wilderness and not in my beautiful town of Hamburg? Well, I finished it on the retreat last weekend and the location is quite a nest. A beautiful one, though still a bit strange for me the City girl. 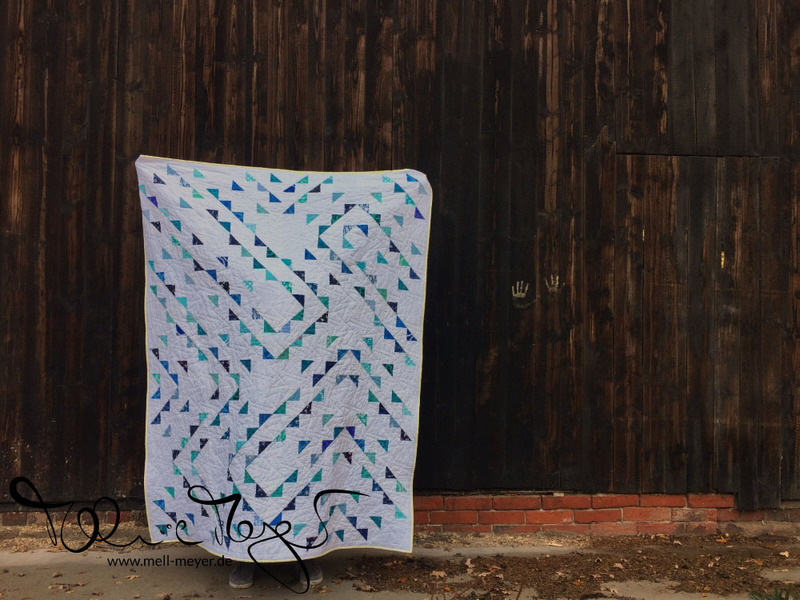 The modern block design by Rachel Singh was published with the Modern Quilt Guild. It is in itself a very unique and modern interpretation of a traditional block. Furthermore the irregular directional placement/layout of the blocks and the somewhat non-standard quilt size do add to that experimental statement. So why not do its name justice and photograph it in this for me atypical environment?! 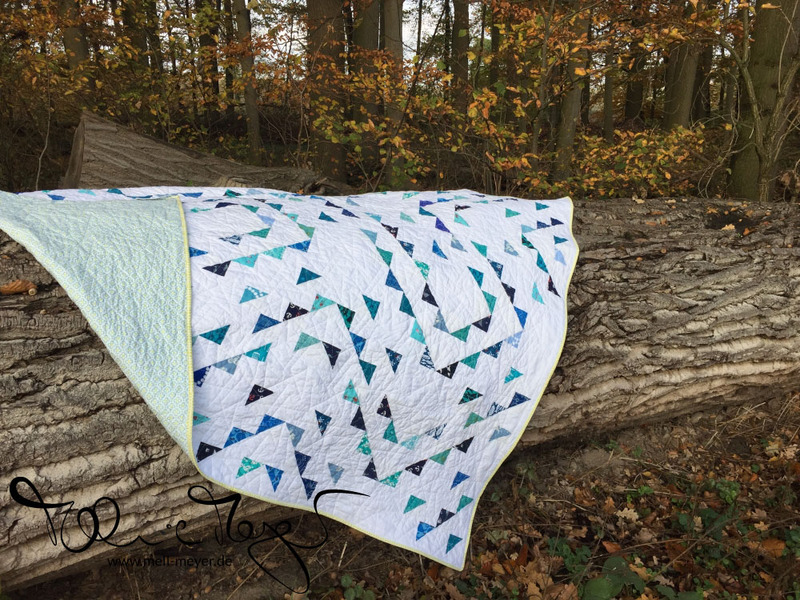 I used the leftover corner triangles from traditionally made flying geese units from this quilt. The amount of those units determined the number of blocks and thus the finished size of the quilt. It finishes at approx. 53×67 inches (135×170 cm). The quilting design is based on this inspiration. It is originally a longarm quilting pantograph but I decided to somehow make it work for my walking foot quilting. You can see more of my process in these Instagram photos. I love the design because it fits perfectly with the triangles in the block design. But it took quite some time quilting it; and lots of twisting and turning the quilt around. The mere stitching time of the quilting was about 20-21 hours. A good hour for every of the 19 lines moving horizontally across the quilt. I picked a blue fabric from my stash for the backing. The binding fabric fit so nicely with the flower centers and I love the pop of color on the front. So here we are again. Finished quilt with label on… photographed, blogged… one project finished, all boxes ticked. Hope you are having a fun & productive sewing time, too! Congratulations!! The photos are lovely!! And the quilting looks great :-) It’s wonderful that you were able to make the most of the leftovers from another quilt to create just that, another one (and that’s not what patchwork in its core is about? to make the most of tiny fabric leftovers?). I also save those leftover triangles from piecing other blocks, but for the moment they are sitting, rather comfortably, in a box. What a beautiful quilt! I love the colors and the fabulous quilting design. I have had quilts that I have stitched using a walking foot like that, with lots of twists and turns. It is a lot of work but the finished design is worth it. 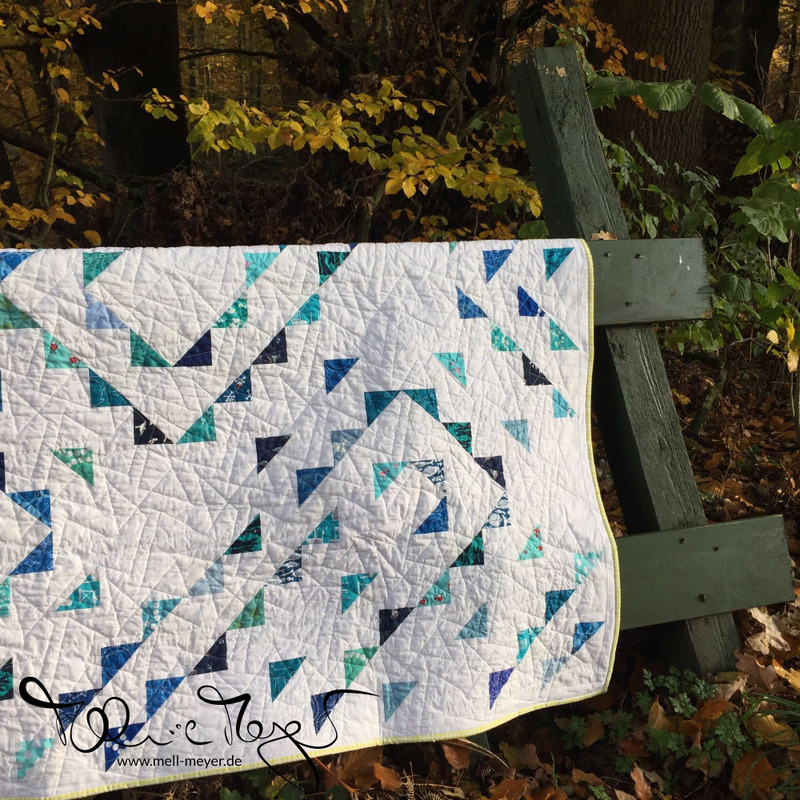 it is a striking pattern turned into a beautiful quilt. May be I should say handsome since it is blue :-) The grassy green binding is the perfect touch. I thought you did not like green. Good to see you stepping out of your comfort zone. Outdoor photoshoots are fun, especially if the weather is good. I love a good snow day. Honestly, the best quilt pictures are against a snowy white background. Of course, after 10 minutes I have to take a break, come back inside, wait for the sensation to return to my fingers before going out again :-D but it is totally worth it. Hope you are staying warm. Hugs!!! 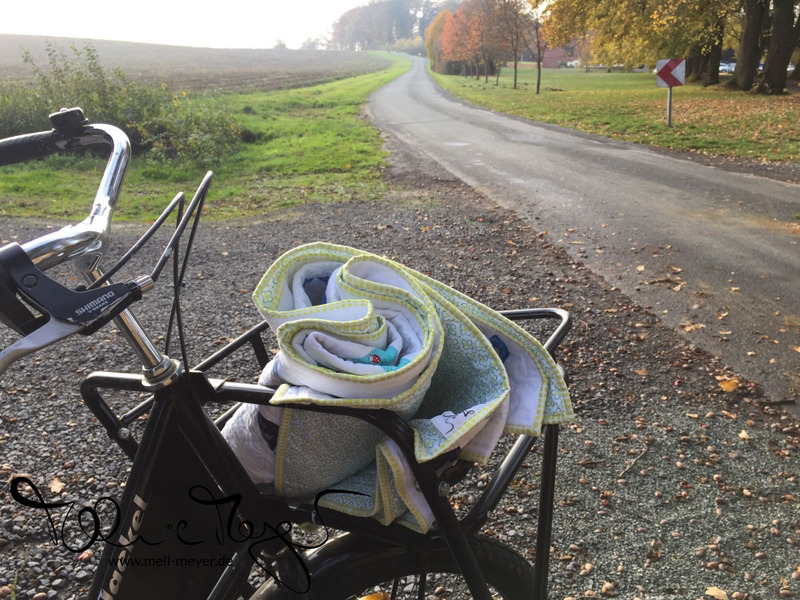 I write to you from small town USA, Nelsonville, Ohio and I discovered you and the Modern Cologne Quilters blog last week and have throughly enjoyed everyone’s work and efforts. Melanie I am in awe of you talent and creativity. Love your modern take on design and fabric. Your walking foot quilting is fabulous. I also want to comment on your PINK HST quilt. This particular quilt has caught my fancy and with your permission I would like to imitate. It would be for my granddaughters best friends 16th birthday. This would be the perfect quilt for Grace. Any information you would care to share would be appreciated, for instance block sizes,. Did the fabric choices come from your stash or are they from a particular line? Clearly, I don’t have enough pink in my stash. A shopping trip or two will be required. Beautiful quilt and beautiful photos. Just beautiful, Melanie! I know the quilting took *forever*, but it was well worth it. 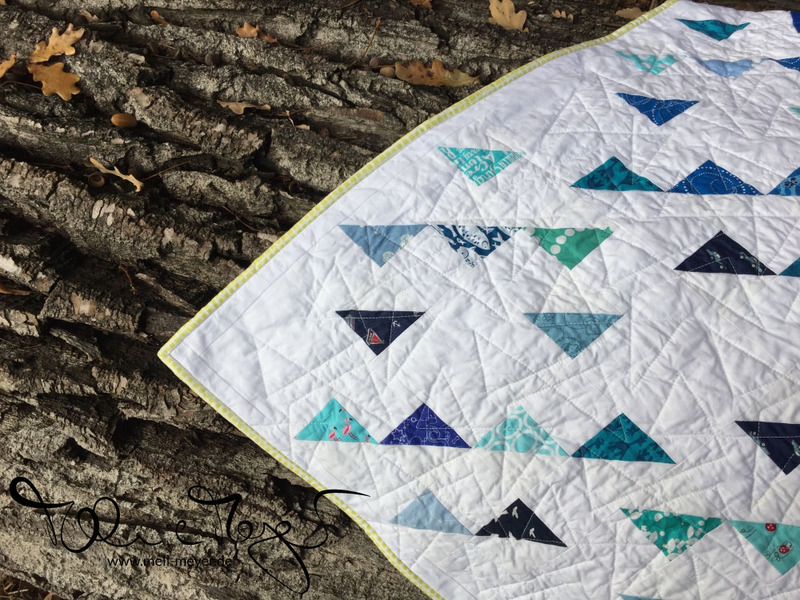 I don’t think this finish would be „Nonconformist“ without the quilting pattern you chose. Ohmygoodness… I LOVE THIS!!!! It’s so gorgeous and your photography is perfection. And that label?! All the heart eyes. 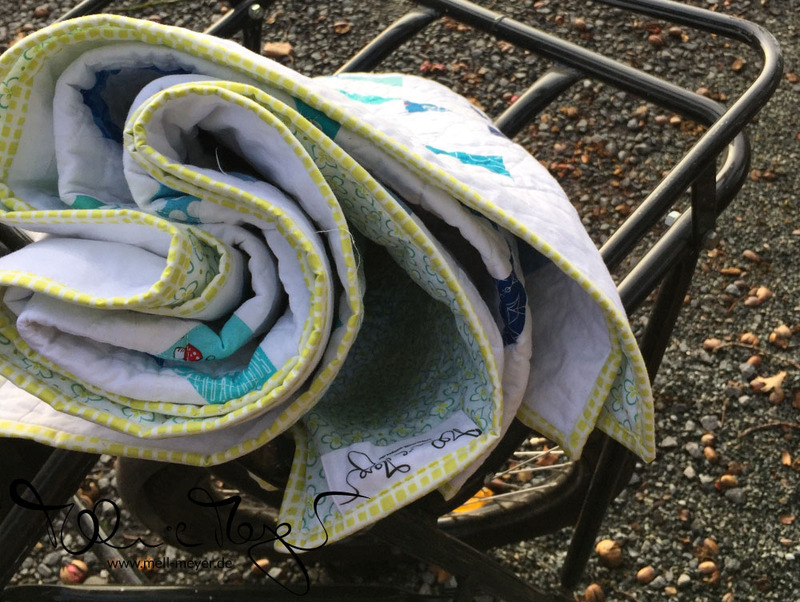 And that is a LOT of time spent quilting… but seeing the finished project, time well spent for sure. Gorgeous! Well, I happen to think that the setting is quite striking ; ) I looks like you are the one checking things off the list, and I am the one passing by the sewing room without stepping in it. Finally made back in this week to work on undercover projects… hmmm, still no sharing. 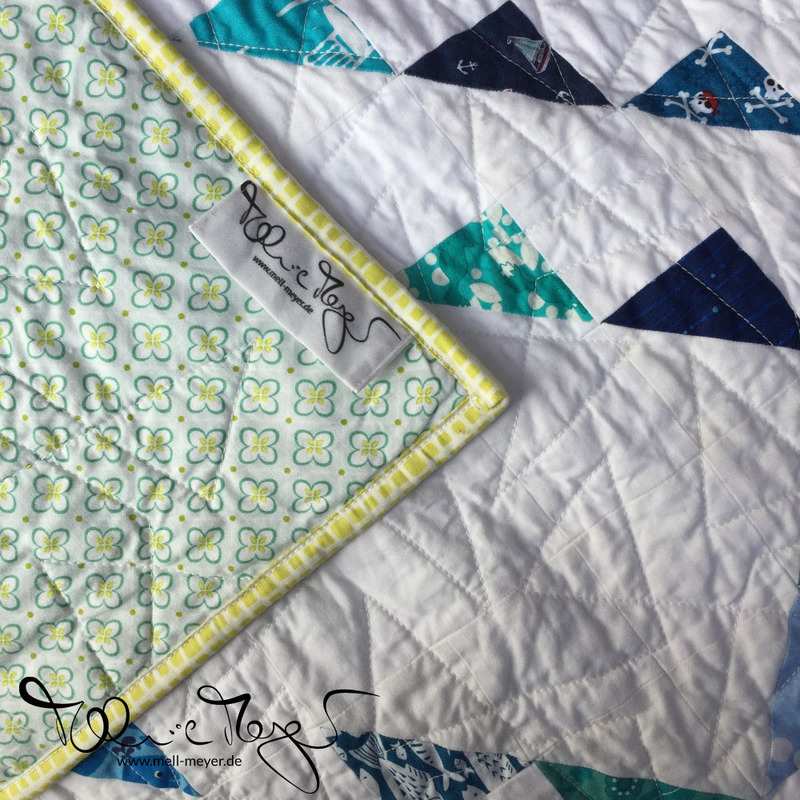 This turned out great despite your frustrations with your choice of quilting lines – yeah! Yeah, another finish. When seeing you finish a quilt it reminds me on the big list of UFOs you once posted. Whenever you start a new project I think by myself: Oh no, the list is getting bigger. So today is just celebration of the accomplishment. By the way, I love your tag.